White tennis shoes or sneakers are a style classic. They always look simple and fresh unless they're covered with scuffs, marks or stains. Luckily, there are a few different methods for removing stains from white tennis shoes. Whether it's one particularly tough stain, or your entire shoe just needs a once-over deep cleanse, there are methods to restore your white tennis shoes. Plus, you can implement additional protective steps to help prevent a future staining situation. The first step to restoring white tennis shoes is a deep clean and removal of stains. This can be done in a multitude of ways. 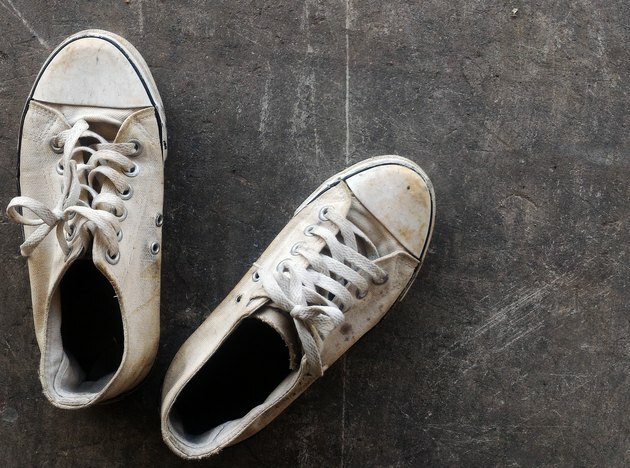 You can use regular dish soap to spot clean a pair of white sneakers. Fill a large washing bowl with warm water, add a small amount of dish soap and make a lather with your hands. Use an old toothbrush to apply the soapy water mixture to stains. You can repeat this process as many times as you need until the stain is adequately removed. If you have a stubborn stain, you can use a commercial shoe cleaner. These usually come with an applicator and special instructions. Generally, you apply the remover, wait for the stain to lift and then rinse the shoe with a damp cloth or sponge. Again, this can be repeated as needed. You can also create a homemade stain remover. Cleaning shoes with baking soda and vinegar is a good method for stubborn stains. Mix baking soda and vinegar into a fairly thick but spreadable paste. Apply this paste over the stain using a toothbrush. Allow this paste to dry until it's completely hardened, usually around four hours. As it dries, it should draw the stain out. You can remove the dried powder using a stiff-bristled brush. This method works better for one targeted stain rather than shoes that are generally soiled all over. Another at-home trick for removing stains from tennis shoes is toothpaste. Work the toothpaste into the stain using a toothbrush in firm, circular motions. Allow it to work on the stain for around three hours. Then, remove the toothpaste and dirt using a damp sponge. If the stains on your shoes are on the rubberized sole rather than the shoe fabric, you can remove them using a Magic Eraser sponge. The majority of white tennis shoes can be washed in your washing machine. Make sure to put them on a gentle cycle, and don't run a spin cycle because the shoes could damage your washing machine drum. You can use ordinary detergent, but if the shoes are heavily stained, you can also add a small amount of bleach. Make sure to keep your bleach concentration fairly low, as too much can damage your shoes and even make the white appear slightly yellowed. After you've removed the stains from your white tennis shoes, you can add a layer of polish to make them look their best plus protect them from future staining. Apply the polish with a soft brush and then buff to give amazing brightness and shine. It's also recommended that you spray your shoes with Scotchgard or other protective spray. This helps to waterproof your sneakers and protect them from any future encounters with dirt. If your white leather sneakers have any visible dirt on them, you can use a bristle brush to loosen it and then knock your shoes together to remove the dirt. If the dirt is more intense, you can wash your leather sneakers like you would hand wash delicate laundry. Fill a bowl with warm water and detergent. Soak your shoes and then go over them with a soft-bristle brush to work in the detergent. Very stubborn stains can be lifted using toothpaste. Work it into the stain, allow it to penetrate and then remove it with a damp cloth. Polishing your white leather sneakers and using Scotchgard is highly recommended to prevent future staining.